Of course, this show wasn’t the purpose of the increase..but the show did influence a generation kids to be paramedics and firefighters. Emergency! was created by Jack Webb, Robert A. Cinader, and Harold Jack Bloom. Webb and Cinader also created the police dramas Adam-12 and Dragnet. Fire Station “51” was where they were based. At that time there was no station 51 in Los Angeles. In 1995 when Universal City needed a fire station they opened one and it became 51 in honor of the show. The show followed two firemen – paramedics that would get calls for car wrecks, earthquakes, fires, and any kind of emergency taking place. The show starred Randolph Mantooth as John Roderick “Johnny” Gage and Kevin Tighe as Roy DeSoto. 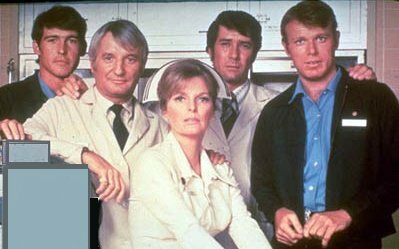 The hospital staff included Julie London as Dixie McCall, Bobby Troup as Dr. Joe Early and Robert Fuller as Dr. Kelly Brackett. Adam 12 and Emergency! would sometimes cross over to each other’s shows. There were a couple blink-and-you’ll-miss-it crossovers between Emergency! and the motorcycle patrol show CHIPs. Squad 51 can be seen responding in the season one episode “Cry Wolf,” while in season two’s “MAIT Team” Engine 51 and Squad 51 show up to the scene of a horrific pile-up. I liked Emergency! as a kid…I prefer Adam 12 because of the 30-minute format compared to the hour of Emergency! but it’s a good show. From EMS World…this article about the show. I never saw this show, but I wasn’t staying home and watching TV in the 70s. You were having much more fun I’m sure! Yes going out every night. I missed the 80s television shows for the same reason. I loved that show as a kid. Didn’ t know it influenced civic governments to expand role of FD though- good for it! Only recently did I find that before this show, Bobby Troup was largely known as a singer and he wrote “Route 66”! That is cool…I didn’t know that. Wow… Great song. My mom and I watched this almost every week. I didn’t realize how groundbreaking it would turn out to be. I love that a real “Station 51” came out of it. I know…You know Adam 12 I watched as a kid…and this one…I didn’t realize how adult some of the stories were. I have all of both…they stand up very well today. Jack Webb went to great lengths to have it real. It seemed like there were a bunch of these types of shows there for a bit. Truly amazing how this show spurred the development of paramedics across the country. I wonder sometimes if TV is where the “overlords” try out ideas before putting them into action. If Emergency had been a flop… I watched it and thought “Johnny Gage” was a hottie. Lol… I always got the Adam 12 guys mixed up the the Emergency guys… Each team had an older blondish person and a youngish dark headed one….”hottie” as you say. We are the guinea pigs of the TV Gods.